LEAGUE ONE KICK-OFF: Twitter says Posh will finish fifth! Chris Forrester is the most popular choice to be Posh 'Player-of-the-Year'. Photo: Joe Dent/theposh.com. Peterborough United will finish fifth in League One, according to the club’s fans on Twitter. The Peterborough Telegraph asked four questions of the local Twitterati ahead of the new League One season. Callum Chettle has been predicted to become Posh 'Player-of-the-Season. Photo: Joe Dent/theposh.com. 1) Where would Posh finish? 2) Who would finish first? 3) Who would finish last? 4) Who would be Posh ‘Player-of-the-Year’. Marcus Maddison was a popular prediction to become Posh 'Player-of-the-Season. Photo: Joe Dent/theposh.com. And here is a summary of the replies. 1) The average predicted finishing Posh position of those who responded was 5.83. 2) The most popular predicted Posh finishing position in League One was fifth. 3) Charlton were tipped to win League One by 15 respondents with Bolton, Millwall and Sheffield United each receiving 10 votes. Posh fan Ian Gow thinks Posh will finish ninth in League One this season. 4) Other teams to be tipped to finish top were Bradford City, Coventry, Gillingham, MK Dons and Posh. 5) Fleetwood received the most bottom­-placed predictions with 14, closely followed by Oldham with 11. 6) Other teams to be tipped to finish bottom were AFC Wimbledon, Bolton, Bradford City, Bristol Rovers, Bury, Chesterfield, Fleetwood, Northampton, Oldham, Port Vale, Shrewsbury, Walsall. 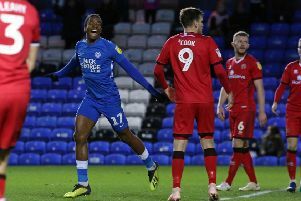 7) Captain Chris Forrester was deemed the most likely winner of the Posh player­-of-­the­-year with 12 nominations, one more than Marcus Maddison. 8) Other Posh players to be tipped to become the club’s player-­of­-the-­year were: Jermaine Anderson, Calum Chettle, Shaquile Coulthirst, Calum Elder, Leo Da Silva Lopes, Chris Forrester, Andrew Hughes, Tom Nichols, Michael Smith, Ryan Tafazoli, John Taylor and Paul Taylor. 4) Jermaine Anderson (as long as he stays beyond January). 4) Leo Da Silva Lopes.